Kobold has introduced its new MIM (magnetic inductive flowmeter), with an all-stainless steel body and rotatable TFT-display for flexible mounting orientations. The unit offers two arbitrarily configurable outputs, as well as resettable and grand totalisers, making the MIM ideal for accurate and reliable measurement and monitoring tasks. The new flowmeter was developed for measuring and monitoring smaller and medium-sized flow of conductive liquids in pipes and operates according to the electromagnetic measurement principle. Faraday’s Law of magnetic induction states that a voltage is induced in a conductor moving through a magnetic field. The electrically conductive measuring agent acts as the moved conductor. The voltage induced in the measuring agent is proportional to the flow velocity and is therefore a value for the volumetric flow. The flowing media must have a minimum conductivity. The induced voltage is picked up by two sensing electrodes which are in contact with the measuring agent and sent to the measuring amplifier. • Flow and temperature measurement. 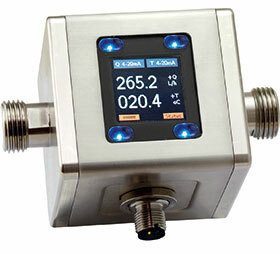 • Monitoring, dosing and transmitter function. • Coloured, multi-parameter configurable TFT-display, rotatable in 90° steps. • Intuitive setup menu via four optical touch keys.